Posted by Jennifer Eberhard on Tuesday, November 6th, 2018 at 1:51pm. A lot of people think the best time to buy a house is during the Spring market. And, it is... ...in the sense that more houses are listed for sale in the Spring. But, there's also a heck of a lot more buyers trying to buy those listings. The thing is, some of the houses listed back in the Spring don't end up selling. (Usually just because they were overpriced.) Now, it isn't like new listings don't happen in the Fall. There are always new listings coming on the market. But it's not like, just because it's Fall and not Spring, prices are necessarily going to fall. In other words, new listings aren't likely to list for a lot lower than you would have seen in the Spring. But it isn't always easy to find those listings. They don't wave a white flag, or lower their price to some ridiculous amount everyone would notice. If only it were that easy... Just because someone listed their home back in the Spring doesn't mean they'll be all that negotiable. There are certain things a great real estate agent will know to look for. And I love rolling up my sleeves and finding the ones we can most likely negotiate the best deals on. So, got anything you want me to roll up my sleeves and look for? Real estate deals won't just fall in your lap, but I can certainly help you find one this Fall. 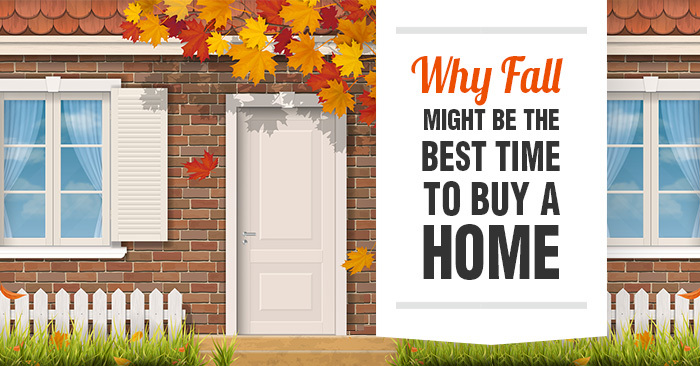 Bonus Want another reason to buy a home in the Fall? You can take advantage of year-end sales to outfit your home! Hardly anybody buys a home who doesn't want (or need) to make improvements, however small. So why not coordinate your purchase with sales on items you'll need? According to Consumer Reports, September is an ideal time for buying carpet and paint. In October lawn mowers go on sale, and the same goes for appliances and cookware in November.